Background: This study examined paediatric antibiotic prescription practices among clinicians at the outpatient level in 10 facilities in Uganda and implemented an intervention to rationalize antibiotic use. Methods: To assess the quality of care, a cross-sectional, mixed methods study was conducted. Findings: A one-year improvement intervention increased first-line antibiotic use for paediatric pneumonia to 97% and reduced unjustified antibiotic prescription for cough or cold, malaria and diarrhoea by 77%, 34%, and 38%, respectively. Interpretation: Scaling up successful changes to improve appropriate antibiotic use can increase access to evidence-based care of common childhood conditions, improve health, and reduce antibiotic resistance. Funding: United States Agency for International Development. Irrational use of antibiotics is widespread across healthcare settings (1). This includes use of antibiotics without clinical indications, treatment of a condition with an antibiotic not recommended for that condition, and incorrect dosing and/or route of administration. Non-indicated antibiotic treatment is a major public health threat worldwide (4). It inflates treatment costs, reduces treatment effectiveness, increases the risk of adverse events and is a recognized driver of antibiotic resistance (2, 3). Inappropriate antibiotic use for common childhood conditions is even more pronounced in low- and middle-income countries (LMICs). According to the World Health Organization (WHO), only 70% of pneumonia cases in LMICs are treated with an appropriate antibiotic, and about half of all acute viral upper respiratory tract infections (RTIs) and viral diarrhoea cases are treated inappropriately with antibiotics (5). There is also a widespread approach in many LMICs to use antimalarials for patients with positive rapid diagnostic test (RDT) results and antibiotics for RDT-negative cases during the management of fever, with little or no attempt to rationalize the antibiotic treatment based on the appropriate assessment and differential diagnosis of the RDT-negative fevers (6). Such approaches result in the widespread practice of prescribing broad-spectrum antibiotics for the treatment of RTIs, diarrhoea, and suspected malaria in sub-Saharan Africa and similar settings (7). The WHO Global Action Plan on Antimicrobial Resistance (Objective 4, target 142) identifies evidence-based prescription of antibiotics for specific diagnoses as an important strategy to optimize the appropriate use of antimicrobial medicines (2). Despite widespread acknowledgement of clinically unjustified antibiotic use, facility-level data to identify gaps and guide interventions to improve evidence-based antibiotic prescribing practices are limited in LMICs. 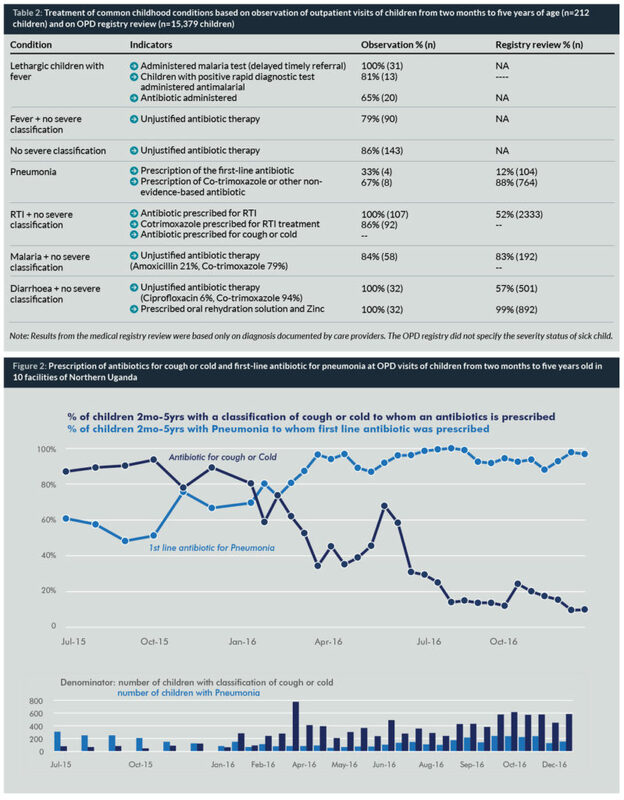 Numerous quality improvement (QI) strategies have been used to improve antibiotic prescribing practices for common childhood infections. A recent systematic review concluded that interventions to improve antibiotic prescribing practices for hospitalized patients can improve clinical outcomes and reduce antimicrobial resistance (AMR) and hospital-acquired infections (8). A review of interventions to improve antibiotic prescribing practices in outpatient settings called for multifaceted interventions that target specific prescribing behaviours and barriers to change in communities (9). However, these reviews noted the low quality of published studies and called for research across different contexts to understand the most effective and cost-effective interventions to improve rational antibiotic use. Most studies on improving antibiotic prescription practices are from high-resource settings with well-developed information systems and embedded improvement tools (10), and their applicability to LMIC settings is limited (10). While many healthcare QI interventions have been successfully implemented in resource-limited settings (11, 12, 13), the evidence of their effect on improving rational antibiotic prescription in LMICs, including Uganda, remains scarce. This study examined antibiotic prescription practices for common childhood conditions (RTIs, malaria and diarrhoea) at outpatient settings and implemented and routinely monitored an intervention to rationalize antibiotic use as an integral part of the Integrated Management of Childhood Illness (IMCI) improvement intervention in Northern Uganda. This intervention was implemented in Uganda by a USAID-funded technical assistance project. Established teams of care providers in eight health centres and two hospitals in three districts of Northern Uganda, supported by a project consultant and coaches working at the district-level of government, identified gaps in the care of IMNCI and tested, implemented, evaluated and instituted changes to improve care. Quality improvement teams of intervention facilities were supported through monthly on-site coaching visits to build and reinforce clinical and improvement skills and support group problem solving, regular progress monitoring using common IMCI process indicators, and sharing of improvement experiences within and across health facilities. As an essential first step to initiate evidence-based improvement interventions, a cross-sectional, mixed methods study was conducted in October–November 2015 to assess the quality of IMNCI services. Specifically, the quality of IMNCI was assessed using provider interviews, direct observation of paediatric outpatient visits and retrospective reviews of medical documentation. The assessment focused on compliance with evidence-based IMNCI practices and supporting system functions at the facility level, such as availability of essential infrastructure, commodities and other physical and human resources. Because of limited standardization and completion of the medical documentation of paediatric outpatient visits, compliance with severity assessment, classification and counselling best practices of common childhood conditions were mainly assessed from direct observation of outpatient visits of all sick children under five-years of age during the assessment visit. Rational prescription practices among children with specific clinical conditions (pneumonia, cough or cold, diarrhoea, malaria), were assessed based on direct observations and medical documentation review. Assessment of rational antibiotic prescription practices focused on clinically justified use of an antibiotic and prescription of a first-line antibiotic. The progress of the improvement intervention was routinely (bi-weekly) measured through a review of medical records in intervention facilities using standardized WHO IMCI recommendations for low-income settings. The intervention districts were selected based on perceived poor quality of IMCI and concurrent improvement efforts in maternal and newborn care to maximize the health gains. Non-randomized intervention facilities were selected based on high volume of services, representation of all levels of care, and existence of referral linkages within the facilities. The improvement intervention was implemented in 10 intervention sites from January 2016 to February 2017. Baseline review of registers revealed the absence of a standardized place to document vital signs, other signs and symptoms of illnesses, severity assessment results, and counselling practices for common childhood conditions. It also revealed poor documentation of patients’ weight, even when a standardized place was available. 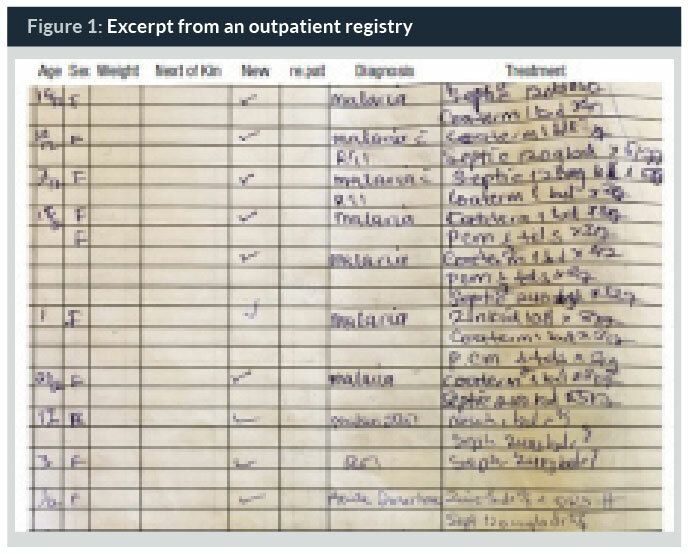 As indicated in Figure 1, the only clinical information documented in the register related to outpatient visits of children was diagnosis and prescribed treatment. 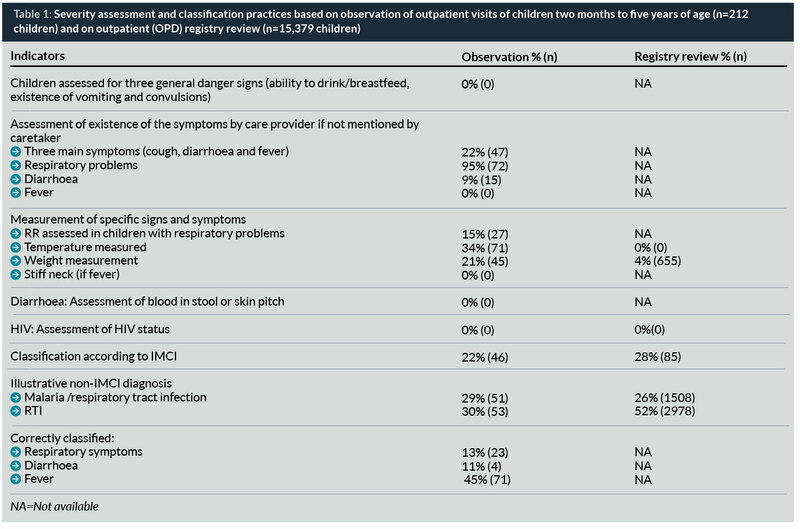 Direct observation of outpatient visits of children under-five revealed critical gaps in severity assessment and disease classification practices according to IMCI. Specifically, no child was assessed for three general danger signs (able to drink/breastfeed, history of vomiting and convulsions) and only 22% of children were assessed for existence of three main symptoms (cough, diarrhoea and fever). If the caretaker did not present as a reason for seeking care, respiratory problems were assessed in 95% of children by care providers, diarrhoea in 9%, and fever or ear problems in none of the children. None of the caretakers were asked about the HIV status of the mother or the child (Table 1). Similarly, out of 178 children having cough or breathing problems, respiratory rate (RR) was counted only in 27 children (15%). Temperature was measured only for 71 children (34%). None of the children presenting with fever was assessed for stiff neck, and none of the 36 children with diarrhoea was assessed for history of blood in stool or had the skin pinch checked. Poor assessment practices create missed opportunities to properly classify, diagnose, and manage sick patients and lead to poor child care outcomes. Gaps in severity assessment practices and providers’ ability to differentiate common childhood conditions resulted in unjustified and broad diagnosis which did not allow for evidence-based treatment of sick children. Observation of outpatient visits of sick children revealed that respiratory symptoms, diarrhoea, and fever were correctly classified only in 13% (n=23), 11% (n=1), and 45% (n=71), respectively (Table 1). Out of 104 children with respiratory symptoms, 58% were classified with such broad categories as RTI (n=53) or RTI/malaria (n=51), and out of 5751 RTI-related cases recorded in the outpatient register, 78% (n=4,486) were improperly classified as RTI (52%, n=2978) or RTI/malaria (26%, 1,508). Such broad and unjustified diagnosis, not consistent with internationally recognized disease classifications (including IMCI), limits the opportunity to provide evidence-based treatment of thousands of sick children in Northern Uganda. Analysis of treatment practices of common childhood conditions demonstrated important gaps in rational antibiotic prescription practices, including justified antibiotic treatment, prescription of the first-line antibiotic and giving the antibiotics when needed (Table 2). Namely, observation revealed unjustified antibiotic treatment among sick children with no severe classification alone or coupled with fever, malaria, and diarrhoea in 86% (n=143), 79% (n=90), 84% (n=58), and 100% (n=32) of cases, respectively. The first-line antibiotic was prescribed to only 33% of children with pneumonia. Antibiotics were not given to 35% (n=11) of severely ill, lethargic children with fever, while providers prescribed antibiotics to all children with RTI and no severe classification. Shifting the tasks of anthropometric measurements and assessment of vital and danger signs to village health team members assigned to facilities. Main challenges hindering proper assessment of the sick children were critical shortage of care providers and high volume of the outpatient visits in supported facilities. To address these challenges, village health workers, assigned to facilities, were oriented and involved in assessment of sick children and documenting the measurements before the outpatient visit. Facilities also re-organized the OPD to set up a fully-equipped triage point where danger signs and other vitals could be assessed at one time (one stop shop). These changes allowed care providers to save time on childhood assessment and make informed decisions. Developing and displaying job aids guiding assessment requirements, classification, and treatment of common childhood conditions based on WHO IMCI recommendations. To improve access to and use of up-to-date, evidence-based clinical recommendations, the project team supported facilities to develop clinical decision support tools guiding assessment, classification and treatment of high burden paediatric conditions. The project also built clinical and improvement capacity of facility teams in management of common childhood conditions through routine coaching visits with the district health teams. The coaching focused on addressing identified gaps and improving assessment, proper diagnosis and rational antibiotic treatment of common childhood conditions. External mentorship was accompanied by orientation, regular clinical supervision and feedback provided by experienced staff members of facility teams to new or less experienced care providers. This approach strengthened resiliency of health service delivery systems in supported facilities to address frequent staff turnover. Revising OPD register to document vital and danger signs, vaccination status, and referral. Poor standardization of medical documentation and limited availability of essential information (including signs and symptoms and vaccination status) hindered the opportunity to continuously assess and improve care of sick children. To address this challenge, improvement teams added specific columns in the OPD register to document essential clinical information on children’s outpatient visits. This information was used to regularly assess the outpatient care of children by experienced staff members and provide needs-based mentorship to their peers. In addition, facility teams routinely monitored progress of the child health improvement intervention, analyzing results and refining changes for continuous improvement. 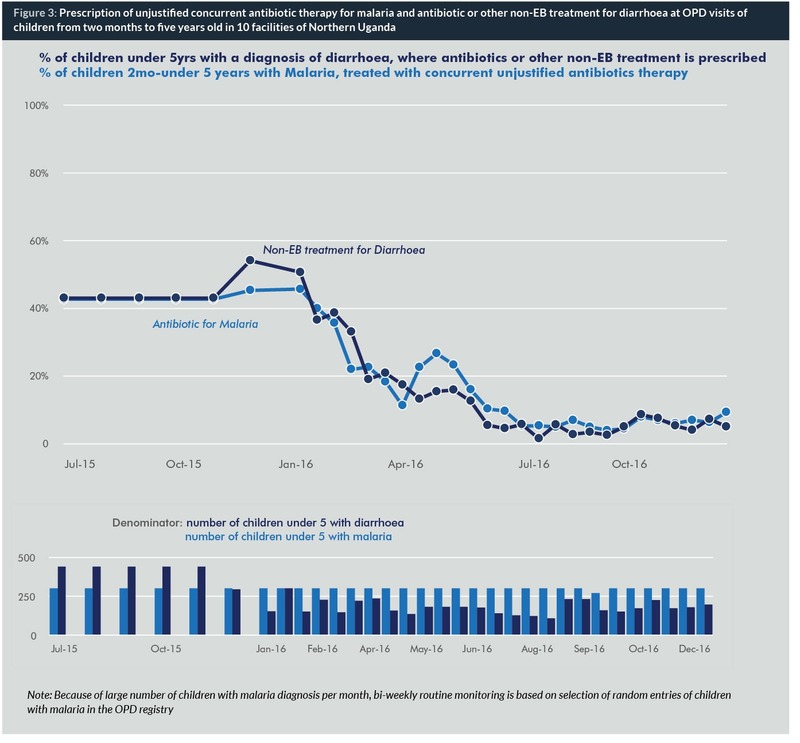 Time series charts were used to monitor the effects of the intervention, based on reviews of randomly selected paediatric outpatient visits from the registry. These demonstrated improved assessment and documentation of vital signs (RR and temperature) and danger signs from 0% to 50% (n=150) and 51% (n=153), respectively during January–December 2016. The intervention also improved prescription of the first-line antibiotic for pneumonia (Figure 2) and simultaneously reduced unjustified antibiotic prescription practices for cough or cold, malaria and diarrhoea (Figure 3). By identifying substantive gaps in quality of severity assessment and classification practices for sick children at outpatient settings, our study shed important light on an area that has been poorly documented and understood in Northern Uganda and other similar settings in sub-Saharan Africa. Gaps in severity assessment and classification practices and providers’ limited ability to differentiate common childhood conditions lead to incorrect diagnosis and consequently, unjustified, non-evidence-based treatment of common childhood conditions. Global monitoring frameworks and action plans (14, 15, 16) target monitoring the progress and improving child care outcomes based on compliance with evidence-based treatment of specific high-burden clinical conditions (e.g., appropriate antibiotic treatment for suspected pneumonia, oral rehydration therapy and zinc for diarrhoea, etc.). Study findings suggest that such an approach needs to be revisited. It limits the opportunity to identify and address existing critical gaps in severity assessment and classification, the essential first steps to guide evidence-based clinical interventions. The emphasis only on evidence-based treatment may also lead to poor child care outcomes due to ineffective treatment of incorrectly classified clinical conditions. Our study identified substantive inappropriate antibiotic use for common childhood conditions. This includes gaps in justified antibiotic treatment, in prescription of the first-line antibiotic and in giving antibiotics to severely ill children when needed. Unjustified antibiotic administration practices for RTI, malaria and diarrhoea revealed by the study call for increased action to improve rational antibiotic prescription for high-burden childhood conditions at the outpatient level in Northern Uganda. Further assessment is needed to shed light on the severity assessment, classification and rational antibiotic prescription practices among hospitalized paediatric patients in Northern Uganda and similar settings. The need to understand current practice, reduce unnecessary antibiotic use and promote effective antibiotic prescription is emphasized in the WHO Global Action Plan to reduce antimicrobial resistance. By stressing the importance of universal access to antibiotics, the Lancet Series argues that appropriate use is one of the important areas to ensure effective coverage with antibiotics. Unjustified use of antibiotics, failure to use first-line antibiotics when indicated, and incorrect antibiotic dosing contribute to ineffective antimicrobial treatment, potential adverse effects, unnecessary treatments and associated costs and the development of antibiotic resistance. Our results confirm that a quality improvement intervention can improve assessment and documentation of vital and danger signs and rational antibiotic prescription by care providers. The study demonstrated that the intervention was successful both in terms of reducing unjustified antibiotic prescription and improving first-line antibiotic use. By improving rational use of antibiotics for treatment of common childhood conditions, the findings of this study support scaling up tested improvement interventions to address inappropriate antibiotic use in Uganda and potentially other settings in an effort to increase access to evidence-based care of common childhood conditions, improve health and reduce antibiotic resistance (2). Dr Tamar Chitashvili, MD, is a medical doctor and public health professional with 15 years of experience in developing, implementing and evaluating policies and interventions targeting high-quality healthcare around reproductive, maternal, newborn and child health (RMNCH) and non communicable diseases (NCDs). As senior improvement advisor at University Research Co., LLC, Dr Chitashvili supports RMNCH and NCD quality improvement efforts in multiple countries. Dr Chitashvili is an associate member of the American College of Obstetricians and Gynecologists. Dr Cherkezishvili, MD, MPH, is a health professional with six years of clinical and 12 years of public health experience. Currently she is a research consultant at URC and leads implementation of BMJ Clinical Decision Support Initiative in Georgia. She holds a medical degree from Tbilisi State Medical University, Georgia and a Masters in Public Health from Kent State University. She is also an alumnus of the Fulbright Foreign Student and Edmund Muskie Summer Internship programmes. Dr Esther Karamagi, MD, MBCHB, MSc, is a medical doctor with a Master of Science in Infectious Diseases from the London School of Hygiene and Tropical Medicine. She has been working in the public health arena for 12 years and for the last eight years, she has worked with University Research Co., LLC to expand the knowledge on improving the quality of health and social care in low-income settings, focusing on a range of technical areas, including maternal, newborn and child health. Esther is now the Chief of Party for URC’s USAID ASSIST project in Uganda. Dr Nicholas Mwanja, MD, is a medical doctor with seven years of clinical and four years of public health experience. He currently works with University Research Co., LLC as a technical officer focusing on implementing, documenting and spreading quality health care interventions for newborns and children under five years of age. He holds a medical degree from Mbarara University of Science and Technology and a Masters of Medicine in Paediatrics and Child Health from Uganda Martyrs’ University. 1. Shapiro DJ, Hicks LA, Pavia AT, Hersh AL. Antibiotic prescribing for adults in ambulatory care in the USA, 2007-09. J Antimicrob Chemother. 2014 Jan;69(1):234-240. 2. World Health Organization. Global Action Plan on Antimicrobial Resistance. 2015;ISBN 978 92 4 150976 3(Sixty-eighth World Health Assembly). 3.Kanavos P, Das P, Durairaj V, Laing R, Abegunde DO. Options for financing and optimizing medicines in resource-poor countries. World Health Report Background Paper 2010;34. 4. Ranji SR, Steinman MA, Shojania KG, Sundaram V, Lewis R, Arnold S, et al. Closing the quality gap: a critical analysis of quality improvement strategies: Volume 4—Antibiotic Prescribing Behavior. In: Shojania KG, McDonald KM, Wachter R, Owens DK, editors. Closing the quality gap: a critical analysis of quality improvement strategies. Technical Review 9 (Prepared by the Stanford University-UCSF Evidence-based Practice Center under Contract No. 290-02-001) Rockville, MD,: Agency for Healthcare Research and Quality; 2006. 5. Kronman MP, Zhou C, Mangione-Smith R. Bacterial prevalence and antimicrobial prescribing trends for acute respiratory tract infections. Pediatrics. 2014 Oct;134(4):e956-65. 6. Baiden F, Webster J, Owusu-Agyei S, Chandramohan D. Would rational use of antibiotics be compromised in the era of test-based management of malaria? Tropical Medicine & International Health 2011;16(2):142-144. 7. Ahiabu MA, Tersbol BP, Biritwum R, Bygbjerg IC, Magnussen P. A retrospective audit of antibiotic prescriptions in primary health-care facilities in Eastern Region, Ghana. Health Policy Plan. 2016 Mar;31(2):250-258. 8. Davey P, Brown E, Charani E, Fenelon L, Gould IM, Holmes A, et al. Interventions to improve antibiotic prescribing practices for hospital inpatients. Cochrane Database Syst Rev. 2013;4(4). 9. Arnold SR, Straus SE, Arnold S. Interventions to improve antibiotic prescribing practices in ambulatory care. Cochrane Database Syst Rev. 2005;4(4). 10. Bourgeois FT, Mandl KD, Valim C, Shannon MW. Pediatric adverse drug events in the outpatient setting: an 11-year national analysis. Pediatrics. 2009 Oct;124(4):e744-50. 11. Broughton EI, Gomez I, Sanchez N, Vindell C. The cost-savings of implementing kangaroo mother care in Nicaragua. Revista Panamericana de Salud Pública. 2013;34(3):176-182. 12. Broughton EI, Lopez SR, Aguilar MN, Somarriba MM, Pérez M, Sánchez N. Economic analysis of a pediatric ventilator-associated pneumonia prevention initiative in Nicaragua. International Journal of Pediatrics 2012;2012. 13. Broughton E, Saley Z, Boucar M, Alagane D, Hill K, Marafa A, et al. Cost-effectiveness of a quality improvement collaborative for obstetric and newborn care in Niger. Int J Health Care Qual Assur. 2013;26(3):250-261. 14. World Health Organization. Monitoring maternal, newborn and child health: understanding key progress indicators. A report prepared by Countdown for Maternal, Newborn and Child Health, Health Metrics Network and WHO.Geneva: WHO 2011. 15. World Health Organization. Consultation on improving measurement of the quality of maternal, newborn and child care in health facilities. 2014. 16. World Health Organization, UNICEF. Ending preventable child deaths from pneumonia and diarrhoea by 2025: The integrated Global Action Plan for Pneumonia and Diarrhoea (GAPPD). 2013.